Developed by Sandlot. Published by D3 Publisher. Released February 18, 2014. Available on PS3, Xbox 360 (reviewed). The problem with Earth Defense Force is that it's utter crap. It has managed to earn itself a fierce cult following through audacity alone, but even as a committed fan of "so bad it's good" media, I can't look past how utterly crap it all is. 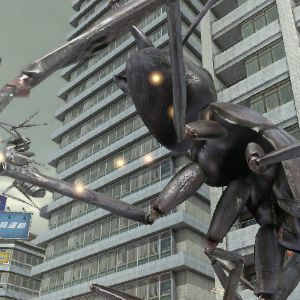 Earth Defense Force 2025 is another in a line of terrible games about shooting giant insects while being told to shoot giant insects by people who talk constantly about how giant the giant insects are. In case you've never heard of Earth Defense Force before, allow me to give you an exhaustive overview of its central premise, as well as the running themes of the series' lore - giant insects. That's about all you need to know. There are giant insects, and you know they're giant insects because everybody with a speaking role in the game tells you they're giant insects. They are terrified that you might know these insects are giant insects, and so they reinforce what they are by constantly referring to them as giant insects, as well as reminding you that your job is attack giant insects. There is, in truth, some arcade charm in such an overbearingly dumb, visually hideous game. As the giant insects (mostly ants, but sometimes spiders and robots because of some reasons) crawl around various regurgitated maps, you are charged with one single task - shoot the giant insects. Chapter after chapter is entirely the same, with the kind of rigid simplicity that would be elegant if it wasn't so tiresome. The giant insects arrive, you run toward the giant insects, and then you shoot the giant insects until all of the giant insects are dead. There are four character classes to choose from. The Ranger is a standard soldier, employing conventional assault rifles and missile launchers in the war against giant insects. The Air Raider is a support character, calling in air strikes and summoning vehicles that can deal major damage to giant insects. The Fencer is a heavily armored, slow moving warrior that carries both a shield and high damage weapon, bringing massive firepower to the giant insects. My personal favorite, the Wing Diver, is a lightly armored flying soldier, vulnerable to attack from giant insects, but very fast and armed with fairly entertaining energy weapons, all of which prove effective against giant insects. While there is a cathartic potential in mindless slaughter, similar to Dynasty Warriors, the general mess that is 2025 fails to provide much in the way of enjoyment. Giant insects aren't all that satisfying to kill, providing little in the way of visual feedback upon death (in fact, the physics are so wonky it's hard to tell the dead ones from the living ones). Friendly fire is ridiculously overpowered, with the Winged Diver able to take herself out in one hit if she suffers any splash damage from her projectiles (and don't worry, NPCs are happy to get in the way of your explosives!). Most enemies outside of the bog-standard ants are a slog to kill, and despite the large arsenal of weapons, only a few feel particularly effective. The graphics glitch out and slow down to an obscene degree, while NPC dialog is repetitive to the point of driving one mad. For many people, this is all part of the fun. It's terrible, and that's why it's great. It's a joke game, get it? It's one joke that makes itself abundantly clear five minutes into the experience, and then repeats itself for hours. Just repeating the same thing over and over doesn't make it funnier. Giant insects, giant insects, giant insects. As well as taking part in mission after mission of the same old guff, you can play local co-op with a friend, or go online with up to three other allies. Multiplayer is a real pain, however, due to that ludicrous friendly fire. This is a chaotic game, and you can deal more damage to your teammates than any one giant insect, a problem compounded by the chaotic nature of fighting so many giant insects at once. I've got nothing against big stupid action games. In fact, they're some of my favorite games of all. 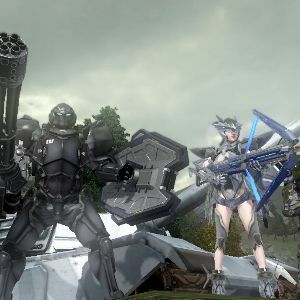 Earth Defense Force 2025 tries too hard at not trying hard enough, like one of those awful SyFy mutant movies. It knows it's terrible, and thinks it can get away with it by doubling down on its own awfulness. Clearly, this has worked for some, as the series has a fanbase. I don't get it, though. This is not so bad it's good. It's just plain bad, and there aren't enough giant insects in the world to convince me otherwise. If Earth Defense Force 2025 has taught me anything, it's that giant insects. Also, giant insects.